Photos by Emily N. Tanaka. 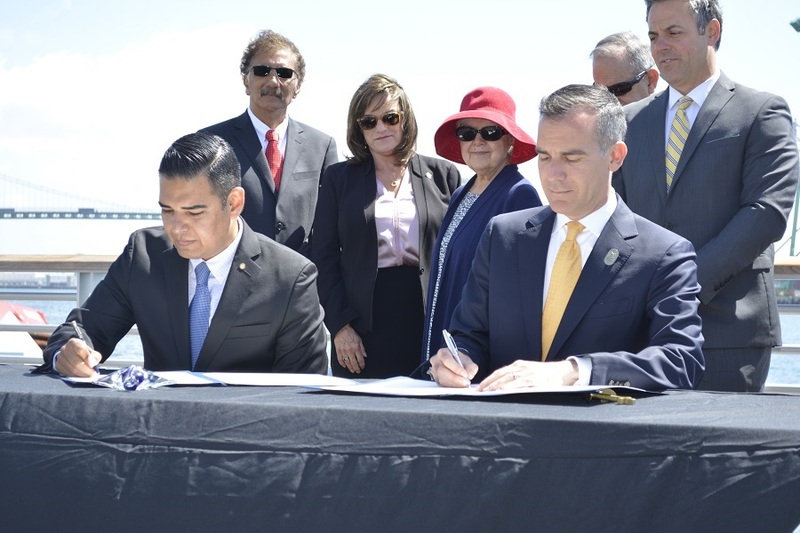 Long Beach Mayor Robert Garcia and Los Angeles Mayor Eric Garcetti joined forces at the San Pedro Harbor Monday morning to discuss and sign an agreement to work toward achieving zero emissions at the twin ports of Long Beach and Los Angeles, and to reaffirm their commitment to the Paris Climate Accord. 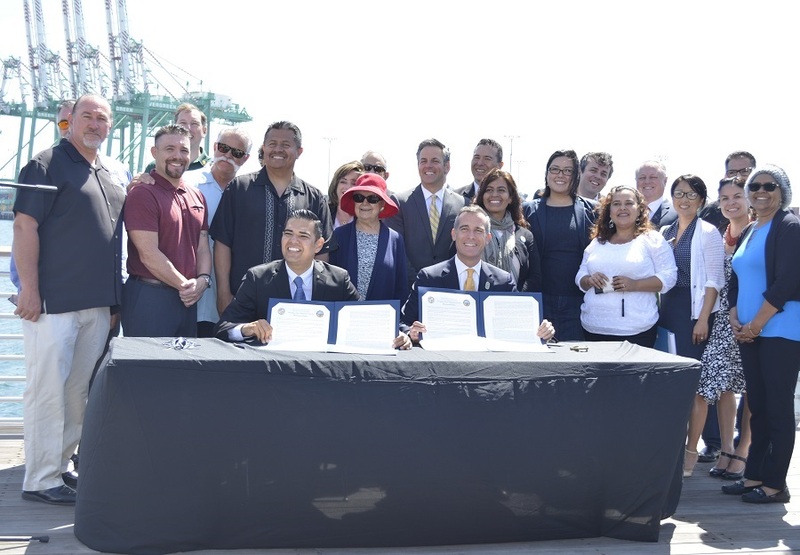 Through signing the joint declaration, the mayors set forth their commitment to advancing clean technology and updating the ports’ Clean Air Action Plan (CAAP) by November 2017. In 2006, the ports of Los Angeles and Long Beach adopted the San Pedro Bay Ports CAAP, in an attempt to reduce health risk and air pollution produced by port-related operations. In the last decade emissions from the ports have been reduced by more than fifty percent. The November update outlines “bold” plans to achieve zero emission for cargo handling equipment by 2030 and cargo handling trucks by 2035, according to Garcetti. “Today is not just a step forward for the ports of Long Beach and Los Angeles but it’s also a direct statement that we will not go backwards in this country and in this region, but that we will push back every step of the way to ensure that we meet the goals of the Paris agreement, and that Los Angeles and Long Beach continue to lead when it comes to clean air and environmental protection,” Garcia said during the event. The announcement comes a week and a half after President Donald Trump announced his intent to remove the U.S. from the Paris climate agreement, leading many city and state leaders, including the governor of California, to voice their commitment to fight against climate change. While California Governor Jerry Brown took off to China to show the state’s dedication to the global environmental cause, local leaders reiterated their commitment to advancing the goals set forth by the Paris climate agreement. In a statement released last Tuesday, Cal State Long Beach President Jane Close Conoley reaffirmed the campus’s efforts to fight climate change.